If you’ve been wasting energy on trying to change people around you, or wasting energy on reacting to the circumstances of your life, ever thought of changing tactics? How about taking that energy and instead applying it to mastering yourself, thereby changing your experiences of other people, and challenging circumstances. Same amount of energy. Vastly different outcome. This is a big clue that you’re acting the victim. When you blame other people for your experience, you’re giving away your power, and making your experience dependent on other people. That means you use all your energy in attempting to get other people to change what they’re doing, so you can have a different experience. I played the victim for far too long in my last long-term relationship. My ex-partner was ‘in the process of giving up weed’ when we started going out. He was going to quit when ‘x happened’. Three and a half years later, I was still waiting for him to quit, so I wouldn’t be going out with an addict and suffering through all that entailed. Finally, I wised up and realised the only reason I was still going out with an addict wasn’t because he couldn’t quit, but because I couldn’t quit. Him, that is. So I did. Left the relationship. Problem solved. Ok, so you’re getting good at catching yourself when you’re blaming other people for the mess you’re in, now take the next step. Take responsibility where you can. Assess what’s going on, and see what aspects you’re in charge of and how you can claim power over yourself. Do what you can, where you are, with what you’ve got. And make sure these steps don’t require any other people to get done. 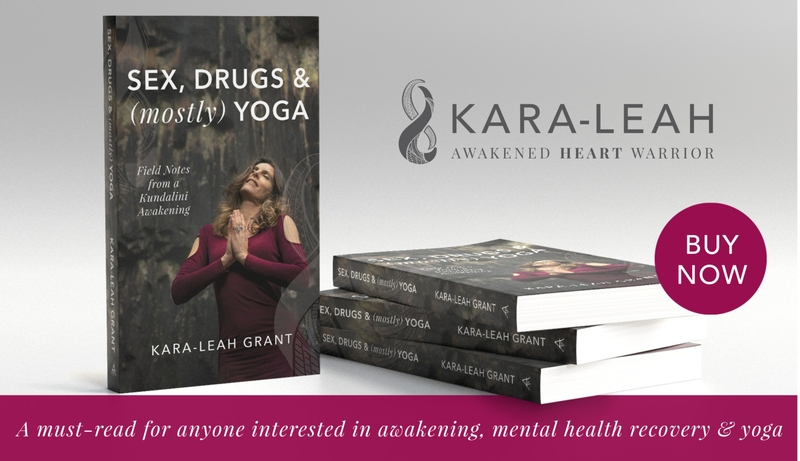 When I came home from Canada in 2004, a mental wreck post-psychosis, I knew that yoga would be an important part of my recovery. Trouble was, I was living in Glenorchy, a small township at the end of a lake with one road in and one road out and nary a yoga teacher in sight. I spent a week or so getting all grumpy at this backward village devoid of yoga teachers. Then I wised up, found a yoga book, and started a home yoga practice. It saved my life. I saved my life. … you’re resisting life. And resistance takes an extraordinary amount of energy, achieving exactly nothing. Except suffering. Think of standing in a swift river, bracing yourself against the flow of thigh-high water and attempting to walk upstream. Compare that to being on that same swift river in a kayak, paddling yourself downstream. Effortless. When my parents divorced, I was seriously pissed-off, and at 12 years old, moody as all hell. I glowered, I sulked, I declared that everything was booooooring whenever we spent time with my father. In short, I did everything a 12-year-old can do to resist the status quo. It created a whole whack of unnecessary suffering for myself and my family. At 12, I can be forgiven for not yet mastering my life. At 22, or 32, or 42, we have no such excuse. It’s happened. Deal with it. And yes, sometimes this can mean facing difficult emotions, so be kind to yourself, and make sure you’ve got supportive and compassionate people around you. 4. Cultivate acceptance, and asking, OK, now what? Ok, this is happening, now what? That short question is magical. It shifts your energy from resisting what’s happening to focusing on solutions. And that’s when magic can happen. You engage both the power of your conscious mind and the power of your unconscious mind. Solutions come to you while you’re running, or in the bath, or dreaming. Plus you discover that it uses more energy to resist than it does to solve. Forward flow always gathers momentum. Case in point. I’d had serious back issues for nearly a decade, including a spinal fusion. I kept hoping that magically, my back would sort itself out. But it didn’t. Finally, I accepted what was going on, went and had x-rays etc to find out how bad it was, and when the results came back… decided I was going to heal myself. That was the beginning of my yoga journey. And healing chronic back issues! Mind shift required. Life is not about cruising through easy street banking cash and playing to your heart’s content. Difficult stuff will happen. Illnesses, accidents, deaths, losses, betrayals, divorces, failure… it will all happen to you, at one time or another. What’s more important is how you perceive it and what you do with it. When the going gets tough, resolve to make it through. When the going gets tough, remind yourself that you can choose to struggle, or you can choose to grow. When the going gets tough, celebrate, because you’re about to get tougher. Two days after I woke up in Lion’s Gate Hospital’s Acute Psych Ward, committed and unable to leave of my own accord, after my second episode of psychosis in a month, I wrote this in my diary. The sun will again shine in my life, so there! Defiant, yes. But I knew I needed to call on that determined and focused energy from within to get me through this tough time. I had to make a stand, and I had to write it down to convince myself I could do it. And I have. Empowerment springs from an internal connection to Source… whatever that is for you. That means a daily spiritual practice, or five. If you don’t have daily spiritual practices, you won’t be connected to Source. If you don’t run daily, you’re not a runner. That simple. Of course, what a spiritual practice is will vary wildly from person to person. The practices that work for me are daily morning pages, walking, pranayama, meditation and movement (dance or asana). Cooking and cleaning are also valuable practices. What works for you could be totally different and include everything from horse riding to landscape painting to welding. What it is doesn’t matter, only that it brings you into the present because it requires 100% of your attention on the now. And that it connects you to a state of flow, to something bigger than yourself. Now practice getting in it daily. I’m doing it right now… dance tunes pumping, while writing and engaging in full body awareness. Oh I’m hungry, I need to eat. Oh I’m thirsty, I need to drink. Oh, I’m mentally scattered and ungrounded, I need to meditate. Oh, I’m emotionlly upset and leaving my body, I need to go for a run and then have a bath. However, we’re so damn good at deferring and denying our needs, that most of us have no skills at all around meeting our needs. Our body needs rest, we plough on. Our liver needs a break, we drink on. We need to be heard, we don’t speak up. Mastering life means knowing exactly what your needs are and meeting them, no excuses. Because you matter. The day I launched the PledgeMe Campaign for The Best of Yoga Lunchbox, I was a mess. Anxious, scattered, fretful, worried and hitting refresh on the Campaign page every hour or so. I needed to practice, and I needed to get away from my computer. So I took myself, and my son, off to the beach. The twenty-minute drive alone was enough to calm some of my nerves, but the Alternate Nostril Breathing at the beach to the sound of the waves was what really brought me home to myself. The change in my state of being was extraordinary. It takes time to get to know yourself, and like anything, the more attention you pay, and the more you act, the better you get. Start by tuning in at least twice a day and taking your energetic pulse. Ask yourself, what do I need right now to bring myself into balance. And then do it. Let’s get one thing straight. You are in charge. Not your mind. And not the hundreds of random thoughts that bounce around inside every day claiming to know what’s going on. But it’s 2pm, who has a bath at 2pm in the afternoon? I do, that’s who, now leave me in peace. It might feel funny at first, talking to yourself. But you’ll soon hear and feel the difference between your mind and your Self. And that’s what mastering life is about – you know who’s who, and who’s in charge. I know, that last one kind of sneaks in there. After all the strong, mastering-type language of the previous eight steps… just… be kind, be compassionate, be accepting and be your Self. It’s real easy to get all hung up on ‘doing things right’ and ‘getting better’ all the time – even yoga and meditation. Sometimes, we need to remind ourselves that it’s ok to be just as we are. Sometimes a victim, sometimes a mess, sometimes pathetic. That’s ok too. Remembering this adds a much-needed softness to our awareness that we are in charge of our own lives, and our own Selves. It can mean the difference between being a dictator and being a Queen (or King). So cut yourself some slack, while taking responsibility. It’s OK to let things slide sometimes, it’s OK not to be perfect, or to have mastered anything.